Popular legend holds that Isaac Newton invented not only calculus, but also the cat door. Unfortunately, this colorful legend is not supported by good evidence. Cats have been domesticated for thousands of years, with the oldest known domestic cat possibly dating back to Cyprus 9,500 years ago. Textual evidence for cat doors can be found Chaucer in The Miller’s Tale, centuries before Newton, and there’s no evidence that the natural philosopher even owned a cat. Nevertheless, the myth has been persistent and varied, initially being used to cut the scholar down to size, and later on used to demonstrate his brilliance. Thomas Jefferson loved mastodons, in part because he wanted to prove that American animals were not degenerate. In the late 1700s a French naturalist, Georges-Louis Leclerc, Comte de Buffon, published a massive, multi-volume natural history called, appropriately Natural History. In it, Buffon outlined what he called his “theory of American degeneracy,” wherein he argued that all people and animals native to the Americas were, well, degenerate. 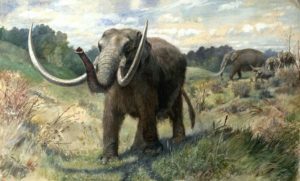 This enraged Thomas Jefferson, who sought to prove Buffon wrong by finding evidence of American mastodons, an animal that the third president still believed was out there, somewhere, roaming the American west. Below: Mastodon by paleo artist Charles Knight from 1897. In January of 1992 international trade routes, bad weather, and a shipping container full of bath toys all collided to form an amazing natural experiment in oceanography. 28,800 bath toys known as Friendly Floatees spilled into the Pacific Ocean, and over the years the easily-identifiable toys washed up on shores throughout the world. Though often referred to as “rubber duckies,” the toys were in fact made of plastic, and, in addition to yellow ducks, also included red beavers, blue turtles, and green frogs. 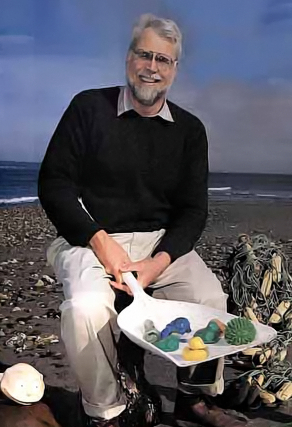 The oceanographer Curtis Ebbesmeyer (pictured below) seized upon the opportunity to study the effects of so much readily-identifiable flotsam released into the Pacific, and eventually found that the Floatees didn’t just circulate in the Pacific. They also made their way to the Arctic, Indian, and Atlantic Oceans. The brightly-colored, cute little bath toys had gone international, and eventually were being scooped up by beachcombers worldwide. The planet Earth holds over seven billion humans. Somehow, against all manner of predictions to the contrary, we feed all of them. This would have astounded Thomas Malthus who, in 1798, predicted that humanity was careening toward a demographic catastrophe, despite the world population still being under a billion at that time. Part of the reason why humanity can now feed itself is because of agricultural advances in the 20th century known as the Green Revolution. Advances in crop yields, land use, pesticides, herbicides, and general efficiency have given us a food supply unlike anything that our ancestors knew. At the forefront of the Green Revolution was a biologist named Norman Borlaug who developed a type of semi-dwarf wheat that saved an estimated billion lives.